UNIGLOBE Travel Gives Back | UNIGLOBE Direct Travel Ltd.
UNIGLOBE Travel agency owners from across Western Canada recently held their annual company meeting in Puerto Vallarta and took time out of their agenda to give back to the local community through a preschool school improvement project. School budgets in Puerto Vallarta many times cannot afford these updates and improvements. Using funds raised from the annual UNIGLOBE Travel conference Silent Auction, UNIGLOBE Travel purchased needed materials such as paint, new chalkboards, roofing materials, light bulbs etc. and worked in teams to complete the improvements onsite at the preschool. Agency Owners also brought with them a substantial amount of school supplies, colouring books, crayons, educational games and backpacks for the children. 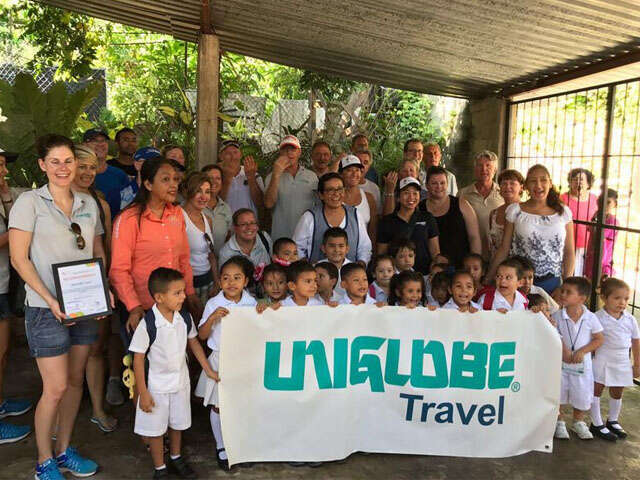 “It was a fantastic way to responsibly give back and make a direct impact on the community we visited, and a great team building exercise” says Irv Wight, President, UNIGLOBE Travel Western Canada.